A cold wind is blowing toward Netflix, and it's called Chilling Adventures of Sabrina. 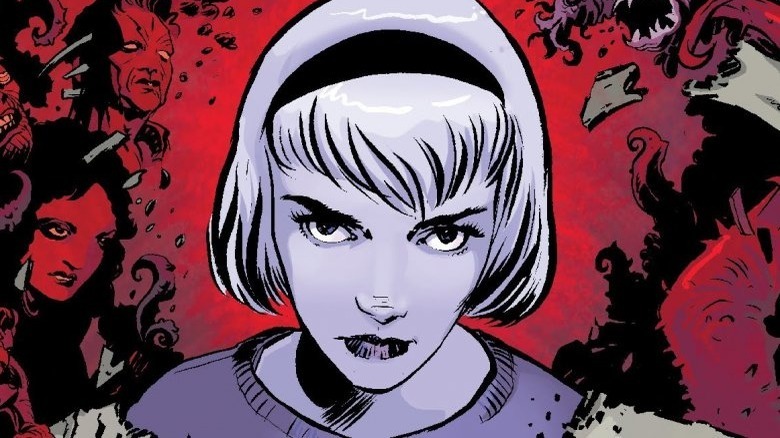 The grim, likely gory coming-of-age story of Archie Comics character Sabrina Spellman, Chilling Adventures of Sabrina now has an official release date. Netflix announced that the series, which stars Mad Men actress Kiernan Shipka in the title role, will hit the streaming service on October 26 — just one day earlier than when season 2 of fellow spooky show Stranger Things debuted in 2017. An October release date is fitting for a series of Chilling Adventures' nature: it's dark, it's creepy, there will probably be a Halloween episode in which viewers are meant to be confused as to who the real demons are and who's just dressed up like one — the list of justifications for a 10th-month-of-the-year launch is long. But what about everything else coming to the streamer in October? Will Chilling Adventures get the cold shoulder, buried underneath other Netflix originals debuting that month? At the time of writing, we know that Velvet Buzzsaw — the horror-thriller written and directed by Dan Gilroy and starring Jake Gyllenhaal, Natalia Dyer, Daveed Diggs, Toni Collette, and John Malkovich — will debut on Netflix on October 26, and that the Mike Flanagan-created horror series The Haunting of Hill House will premiere on October 31. The second season of Castlevania will also bow on October 26. This leaves the series with a bit of competition, but it's nothing that seems insurmountable. Velvet Buzzsaw, The Haunting of Hill House, Castlevania, and Chilling Adventures all appear to have their own target demographics: horror fans, those that love book-to-media adaptations, anime fans and people who adored Konami's Castlevania video games, and Riverdale loyals who can't wait to see what creator Roberto Aguirre-Sacasa does with another Archie Comics character. Looking at the big picture, we're confident Chilling Adventures will heat up Netflix and spark its own fanbase with little trouble — and without stealing attention away from other releases — come late October. Also featuring Jaz Sinclair as Sabrina's best friend Rosalind, Ross Lynch as Sabrina's boyfriend Harvey, and Lucy Davis and Miranda Otto as Sabrina's aunts Hilda and Zelda, Chilling Adventures of Sabrina follows the young witch as she begins her sorceress training, struggles to accept her identity as half-human and half-supernatural being, tries to protect her town's residents from being murdered, and aims to pass as a normal teenage girl and typical sophomore at Baxter High School. Find out if Sabrina is successful in her many endeavors when the series, which Netflix has already ordered for two seasons, premieres on October 26.